So, you’re either looking to buy a new Cricut machine or looking to get started with your current machine, great! This getting started guide for beginners will walk you through everything you need to know, from picking the right machine, understanding the various tools, and an overview of the Cricut Software. Let’s get started learning the Cricut! Cricut is our brand of choice when it comes to electronic die cutting machines for most users. Cricut’s machines are user-friendly, have great cutting abilities, and the ready to make projects make working with Cricut even better. When compared to other popular machines like the Silhouette Cameo (See the Cricut vs Silhouette differences), the Cricut is stronger, more precise, and is the easier to learn. What Can the Cricut Machines Cut? 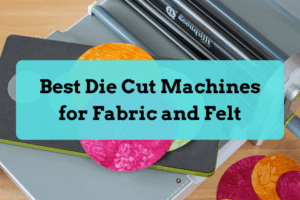 The Cricut die cutting machine can cut over 100 different types of material, ranging from delicate tissue paper to thick leather and even thin wood. Check out the complete cutting list for Cricut. The first step to getting started with Cricut is to pick a machine. We recommend the Cricut Explore Air for most people looking to get started. If you want something a more versatile that can cut fabric and thin wood, the Cricut Maker (our #1 top-rated machine) is worth the upgrade. And for something more simple and economical, the Cricut Explore One, which has one tool holder instead of two, is a good choice as well. Whichever Cricut machine you choose, the Cricut software is the same and they are all great choices. Cricut Explore One – Has with one tool holder instead of two. The most economical choice. Cricut Explore Air – Has two tool holders and has versions. The Explore Air 2 has built-in Bluetooth and ‘fast cutting’ mode features. See our complete Cricut Explore Air Review. Cricut Maker – The ultimate flagship machine by Cricut. It’s 10x more powerful than the Explore and has special tools for cutting fabric and thicker materials. The most premium and versatile choice. See our complete Cricut Maker Review. Whichever machine you buy, consider purchasing the machine as a bundle. Bundles will include tools and material to help you get started and save you money. The best place to buy bundles is either on the Cricut website or from Amazon. Be sure to shop around to get the best price. Cricut often has sales which can save you even more money. There are a few tools that you really need to make creating projects a whole lot easier. Once you get more experienced, you’ll learn how to use them and may even discover other tools that work better. Weeder – A weeding tool is a must-have when working with vinyl. After the vinyl is cut, you’ll need a tool to remove the negative, or background vinyl, that is left over from the project. There are many types of weeder tools that crafters use, everything from the standard Cricut weeder, to fine point tweezers, and even dental picks. Scaper – Another tool that you’ll need is a scraper tool. The scraper tool helps clean off the tiny pieces of paper and debris, keeping your cutting mat nice and clean. I personally recommend the extra large scraper to make things easier, but the regular size scraper will do just fine as well. Spatula – Besides making jokes about flipping tiny pancakes, the spatula is a pretty handy multiuse tool. Its primary function is to lift material off your sticky cutting mat without damaging it. It’s especially great for lifting those tiny pieces without damaging them. Crafters even use it to help with weeding and clean their cutting mat too. Scissors – This is a basic one, but important. 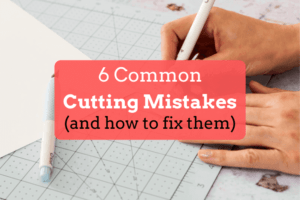 You’ll be cutting all sorts of material when crafting, like paper, fabric, and ribbon. Cricut Scissors are ultra sharp and make precise cuts. Cross cutter – When you are working with rolls of vinyl or paper products in general, a cross cutter will make cutting material really easy. There are even more tools for your Cricut that you’ll want to look at, but these are some of the basics you’ll need to get started. As you gain more experience, you’ll understand what other tools you’ll need and what works best for you. If you haven’t purchased one of the bundles, you can purchase the tools separately, or get them all at once in a set. When you cut anything with your Cricut, you’ll want to place your material on a cutting mat. A cutting mat helps stabilize the material and support it while it’s being cut. You can cut vinyl with your Cricut without using a cutting mat, but it’s more of an advanced method that is not endorsed by Cricut. No matter what Cricut machine you buy, every machine will come with a cutting mat. But, there are different kinds of mats that we should go over briefly. Cricut has 4 types of cutting mats. The cutting mat you use will depend on what material you are cutting. For example, you’ll want to use one cutting mat for cutting paper and a different cutting mat when cutting fabric. After a lot of cutting, mats lose their stickiness. Some crafters keep extra cutting mats on hand so they are always ready to cut. Check out Cricut’s cutting mat guide for a full overview. Like the different cutting mats, there are also different cutting blades for cutting certain materials. Knowing which blade to use for your Cricut is just as easy. Premium Fine-Point Blade (gold) – Cuts paper, cardstock, posterboard, vinyl, iron-on, and other thin to medium weight materials. Deep Point Blade (black) – Cuts thicker materials, such as a magnet, chipboard, stamp material, thick cardstock, stiffened felt, foam sheets, cardboard, and some fabrics. Bonded Fabric Blade (pink) – Same as the premium fine-point blade, but dedicated for fabric to make sure the blade last longer. Knife Blade – Cuts thicker or hard materials, like balsa wood, leather, and craft foam. Rotary Blade – Cuts soft and flexible materials, such as silk, denim, cotton, burlap, and canvas. Scoring Wheel – Technically not a blade, but we put it on the list. This tool creates score lines, perfect for cards and 3D designs. Cricut offers a lot of support and has a great guide describing the differences between their cutting blades in more detail. Besides cutting, Cricut machines can also draw. Cricut makes their own pens, which are water-based, acid-free, nontoxic, and permanent after drying. Cricut makes a lot of pens that come in different colors and points, so you can get the exact calligraphy that you want. There even adapters on the market so you can use your own pens. Check out all the pens Cricut offers here. Cricut Design Space is the free online software that you’ll be using to create your projects. Cricut Design Space is great! It’s one of the more easy software programs to learn compared to other cutting machine software. One thing that’s important to remind people, is that it requires a high-speed internet connection. If you have a slow computer or slow internet, working with the software is probably going to be a problem (sorry!). With the above caveat, Cricut does have an iOS app where you can work with projects offline. The app is a little bit more limited than the desktop version, but you’ll be able to design projects on the go and away from your computer. Cricut Design Space is really friendly and comes with basic design capabilities. If you’re a more advanced user who wants to create their own designs from scratch, as you would in Photoshop, for example, you’ll want to use other software and import the images into Design Space. Even if you’re not a designer at all, you can always purchase designs or import them for free in various formats, including JPG, PNG, and SVG. You can even select ready to make projects that are already designed for you! The thing to know with Cricut Access is unless you actually purchase the images and fonts, you only have access to the images and fonts for as long as you keep paying for Cricut Access. Cricut Access is $9.99 if you pay month to month. So if you’re paying for a few designs every month, then Cricut Access will be well worth it. To see all the pricing plans, click here.